Energy and society – an accident waiting to happen? Energy, society, complexity and innovation are intertwined through a multitude of interrelations that are sometimes difficult to grasp. In an earlier post, I’ve offered a storyline to describe this nexus, based on the considerations of Joseph Tainter and Ian Morris. In essence, the energy supply available to a society poses a limit on the complexity this society can sustain, while the continuously emerging problems the society is faced with are solved through innovation that tends to increase complexity. In this understanding, there is a scenario for a potential crisis that can arise when the energy demand (through ever increasing complexity) exceeds the available energy supply. And both, Tainter and Morris present various historic evidence of societies that had to go through this scenario, resulting in what often is referred to as the collapse of the former order. These societies didn’t manage to keep their energy demand in check, i.e., below their available energy supply. I am convinced that this is a very plausible scenario for us, too. At least, if we cannot avoid that the demand curve intersects the supply curve. Depending on how close in time you are to that undesirable intersection, you’ll have more or less options to avoid crisis. However, we usually don’t have the necessary situational awareness to know where exactly we are. So are we just an accident waiting to happen? Or is there something we could do to escape that scenario? 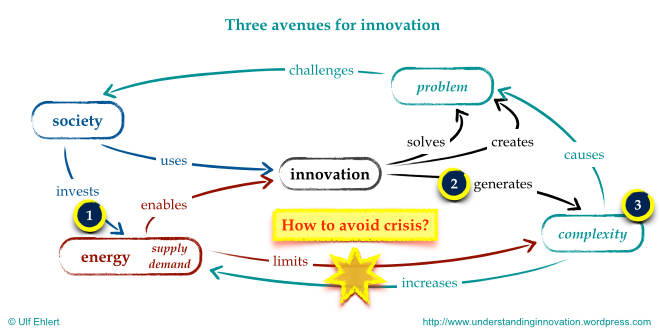 As indicated in that earlier post, I believe there are three potential avenues for innovation that we could employ to avoid such crisis. Today I’ll add some simple charts to depict their essential effects and then dive a little deeper in describing them. 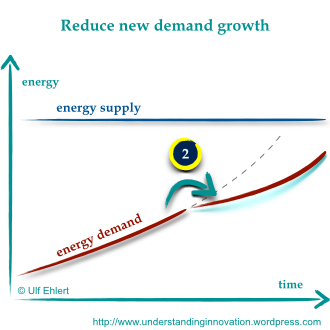 Employing the chart I’ve developed in the previous post, you’ll find the forces driving us toward the potential crisis at the bottom: while the available energy supply presents a limit to the complexity that can be sustained, innovation tends to increase complexity and, as a consequence of that, energy demand as well. In this chart, I’ve located three effective counter-measures we could employ to avoid that crisis and its undesirable effects. These counter-measures all offer an avenue for focused innovation: the first avenue targets society’s investment in increasing energy supply, the second avenue promotes energy efficiency as a means to reduce the growth of energy demand, and the third avenue tackles complexity itself in order to reduce energy demand. 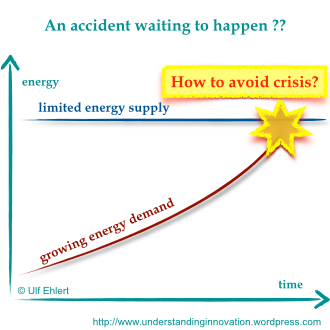 The first avenue for innovation addresses the crisis scenario on the side of energy supply. 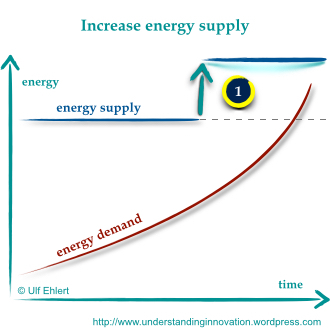 Is is obvious that higher energy supply will increase the gap between demand and supply. At least for some time. However, the exponential growth of energy demand means that the same increase in supply will buy less and less time in the future. If this approach was to work for longer periods of time, we’d actually need to increase the energy supply at least as fast as we grow the energy demand. The utilisation of coal and later on of oil and gas did create short historic periods when supply increase even escaped the demand growth. But those phases were historic exceptions. Today nuclear power is not accepted to replace those fossil fuels. And renewables still have a long way to go before they can reach the fossil scale and reliability. The second avenue approaches the crisis scenario from the perspective of growing energy demand; it promotes increasing energy efficiency as a means to reduce the growth of new energy demand. The key idea is the minimise the wasteful use of the available energy supply. This is of course a noble approach and a step in the right direction. But it predominantly addresses the future increase of energy demand, whereas it has only little effect on the historic accumulation of complexity that has built up the massive foundation of our energy demand today. Only the third avenue for innovation actually tackles the problem of growing energy demand directly at its root: the accumulation of complexity over time. Now, that accumulated complexity is not the result of a big master plan that intends to create complexity. Rather, it is the unintended collective consequence of many, many individual innovations that each intend to solve just one small isolated problem with minimum effort and with the smallest change possible. Societal complexity is the macro-scale outcome of efficient innovation at the micro-scale. We are missing a macro-level understanding of the undesired side-effects of that micro-innovation. Such a macro-view would be the necessary precondition for the third avenue for innovation that could effectively reduce the complexity accumulated by society over time. Maybe all of this is too abstract, and maybe an example might help to grasp the differences between those three avenues. So let’s consider the chaotic, messy build-up in a children’s room: What would the three avenues translate to in such a setting? Avenue 1 wouldn’t seem sustainable, as it would just build larger rooms to contain the mess. Avenue 2 would seem more promising, as it would strive to limit new gadgets and toys so that the mess would grow at a lower pace. Only avenue 3 would actually reduce the existing mess through a thorough clean-up exercise. That third avenue is the approach that we are trying to teach our children (you’ll enjoy a good example in The Berenstain Bears and the Messy Room). Actually, we even leave them a choice: either they themselves limit the chaos in their rooms in a way that is under their control, or their parents will do it for them in a way that they don’t have a say in. It’s time to really transfer this approach from the very local micro-level of raising children to the very global scale of human society. We understand this approach as parents, and we should apply it as citizens as well. Most importantly, we should understand the rules from the perspective of our children: you should make it simple yourself, according to your own rules; for if you don’t do it yourself, somebody else will do it for you, and you won’t like the result. Let me offer a different perspective…. It is true that solving problems requires energy, and that human flourishing requires solving progressively more problems better. However, there is no necessary intrinsic correlation between value and energy. Better solutions don’t HAVE to require MORE energy. For example, a virtual reality hell requires the same energy as a virtual reality heaven. One has nearly infinite value, the other infinite destruction of value. As energy becomes scarce, economics dictates that the incentives to find new sources and to economize will go up. In other words, the system naturally “seeks out” energy efficiency as it seeks value. GDP per unit of energy has been increasing over the last few generations. There is no logical reason why it cannot continue to do so. For example if we imagine a hard limit on energy use for humanity which is, say a thousand times higher than current human energy use (for arguments sake). As we get closer to that hard limit, the economics of problem solving and value creation dictates that cost effective solutions (value increases) will need to come out of using existing resources or flows more efficiently. This is pretty easy to imagine, especially as we shift to a more virtual world and reality. Thanks for bringing in your perspective. I certainly agree with your point that there is no need for novel solutions to increase overall energy consumption. 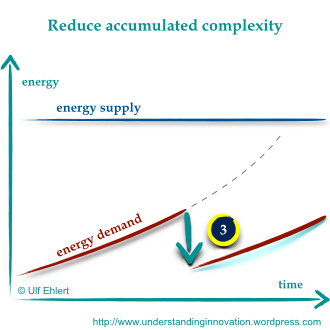 However, I consider that our approach to innovation (the drive to change as little as possible) tends to generate complexity which increases energy demand. That’s a collateral effect, not an intended outcome. Your observation that GDP per energy has increased for some historic while actually started my thinking. Of course it’s positive that we have become more energy efficient in generating wealth. Still, overall global energy consumption is increasing, both absolute and per capita. Which raises my concern over global limits of energy supply that exist outside the economic context. Now, I sense that the Western economies/societies are shifting part of their energy consumption to the emerging economies. Production of consumer goods is one such example. And I’m not sure about the outcomes. This might be zero-sum game (less consumption in the West might be balanced by an equivalent increase in consumption in the emerging economies), it could as well increase the overall consumption through using cheaper, less energy efficient technologies. How would you see that trend unfold? The idea of an “economy of the virtual” probably translates to the information and the knowledge economy. There are signals to herald the advent of such non-tangible value creation, no doubt. Where is the journey going? Would the West replace the traditional production economy with the I&K economy? Will I&K supplement the production economy? And what is the energy consumption of I&K? The end-user doesn’t necessarily see that consumption, but the server farms of the social media enterprises already today rival small cities in their energy consumption. Again, where does the journey take us? Can we be sure that recent historic trends actually hold into the future? And who is right? The engineers who like linear trends? The economists who are excited about hockey sticks? The biologists who are used to S-shaped saturation curves? Food for further thought. If it is possible to convert an expenditure of energy into something of higher value at the same or less expenditure, then it is not INEVITABLE that human progress will come to an end based upon energy limitations. I am in no way suggesting that progress is inevitable or even likely. It is simply possible. And catastrophe is not guaranteed. Today, we are seeing two trends in the US, higher total energy use and lower energy use per unit of GDP. And today, energy is extremely cheap. As energy becomes more scarce (whether in decades, centuries or millions of years?) economics dictates that efficiency will gain in importance. The system will be attracted toward more efficient value creation. In other words as more energy use becomes less affordable, increased value per unit of energy becomes more profitable. I am not worried about energy use or energy limits at the current time. My guess is that our descendants won’t either, but they will need to judge the future when it comes. Hopefully we will be many multiples richer and substantially smarter by then. Jumping to your messy room analogy, I see prices as a signal. It informs us on the costs of a messy room and rewards room cleaning in proportion to this cost. As energy becomes scarce, the payoffs to clean rooms will keep going up to the point that we are crazy not to keep it spotless. I fully agree that there is no guarantee for any projected future outcome, regardless whether the scenario in question is pink or bleak. And I am a self-declared optimist when it comes to the opportunities we have to shape our own future. From an economic and a market perspective, the scarcity-drives-price-creates-incentive-to-fill-the-gap logic is attractive. I only wonder whether this economic lens is the only appropriate reference frame to use. Could we actually monetise everything, express the monetary value of everything? Or is money just the only frame that we currently have? Is money the right currency we should employ? Does it really cover the complete picture? Hence I’m interested in alternative narratives for the past and future development of human society. While money is a very human invention, I understand energy -in the very literal sense- to be a more natural reference frame for such considerations. I have found that a useful heuristic is to use the frame of reference of problem solving, or from a more positive side, SOLUTION CREATION. Every potential solution has pros and cons, costs and benefits including opportunity costs of not pursuing alternative courses of action. Monetization within structured markets allows decentralized individuals to compare and coordinate utilities of alternative courses. In the example here, should we use existing stocks of energy, look for new or more stocks, pursue efficiency in current stocks, or something else? How should the stocks once accessed and processed be distributed? How should they be best accessed and processed and distributed? By whom? Markets are one extremely useful way to solve these problems and allow humans to coordinate activities and combine and compare trade offs. Progress in the largest sense is not an individual thing, it is a collective process which requires coordination, cooperation and constructive competition. Markets — or some as yet undiscovered alternative system — are an essential component of large scale collective problem solving. Very eloquently put. I really like your emphasis on markets as an essential tool that supports decision making and enables problem solving. That’s very rich and triggers my thinking on required transparency, on freedom of access, on prizing mechanisms, on definition of added value, … Lots to think about before I come back to the topic in a future post. Thanks for the inspiration. Keep up the great work. I find your blog is one of the most refreshing and stimulating spots on the Internet.